Are you like me who is managing a number of Windows Server? And might be maintaining multiple credential for each. I know its hard and you have the capability of saving the password. But remembering those server name or url is not that easy and I think this tool is right for you. Microsoft has a manager for that and is called Remote Desktop manager. What it do is enable you to save your servers either per item or you may group them and also state a general setting and credential or even specify one for each. Go ahead and download it at here. 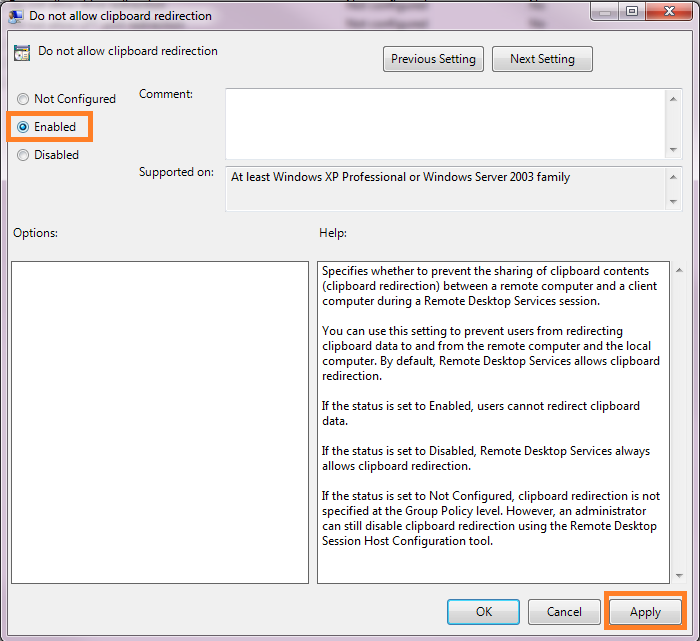 I have given a task to research on the web on how to disable RDP’s Copy and Paste of files due to some security issues. The following Steps should be done with Administrator rights. A Window named Local Group Policy Editor will be shown. A Window named Do not allow clipboard redirection will be shown. Make sure that all users will Log Off and then Login to implement this new settings.